The flag of Alabama shows a crimson St. Andrew's cross on a white field. It's patterned after the Confederate Battle Flag and was adopted in 1895. The bars forming the cross must not be less than 6 inches broad and must extend diagonally across the flag from border to border. Alabama adopted the lovely Camellia as its state flower in 1959. The Yellowhammer, a member of the woodpecker family, is the State Bird. 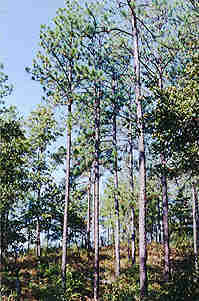 The State Tree is the Southern Longleaf Pine. Needles on this tree occur in bunches of three and are about 12 inches long. The State motto is We Dare Defend Our Rights. States that border on Alabama are Florida, Georgia, Mississippi and Tennessee. Alabama means "tribal town" in the Creek language. The State Song is Alabama, which is playing now. OK, if y'all are ready, climb in the Chevy, click on the license plate and we'll go see the Heart of Dixie.